The discussion of this phone has begun long before its official announcement. The photos appeared in Net were one of the reason that made for it. 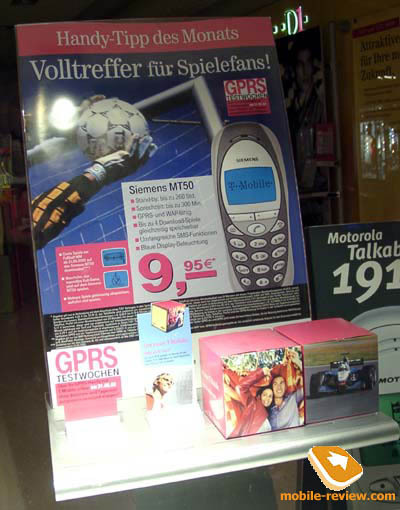 However, the phone design was a little bit different than on that photos. I don't know whether it's better or not but it's obvious that Siemens M50 is a character model. The main rivals are Nokia 3410 and 3510. 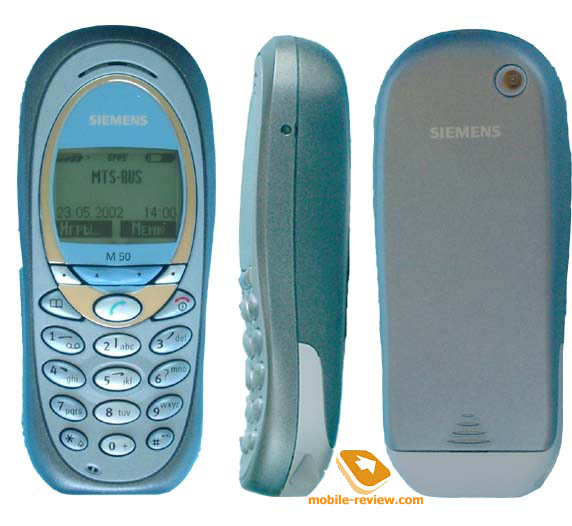 M50 resembles all 45 series from Siemens by its rounded form and internal antenna. Compact dimensions (109x46x23 mm) allow to wear it in jeans pocket or in the shirt. The phone weighs only 97g. thanks to the lithium-ion battery of 600 mAh capacity, which is hidden under the rear cover. This battery has the same form-factor as the batteries of 45 series. According to the manufacturer the phone works 6 hours in the talk mode and 26 hours in the standby mode. 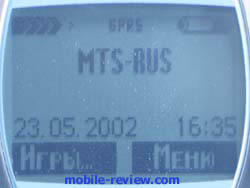 In practice the phone worked 3 days (MTS Network) in case of 35 minutes of talking and 30 minutes using of different applications (games in particular). So as far as autonomy concerned, Siemens M50 is neither a champion nor an outsider. In Germany it worked 4 days in case of 50 minutes of talking in spite of roaming most likely because of the better coverage. A charging time is about 1.5 hours (2 hours according to the manual guide). In Russia two colours are available: Chronium Orange and Chronium Blue. The backlightings of these phones are also different: orange in the first case and blue - in the second. Technical features of the displays are the same. The display (101x64 pixels of resolution) can show up to 4 text lines (16 characters each) and 1 service line with the explanations to the soft-keys. The information is clearly visible in both cases. A keypad made of rubber, keys are rather hard to press. A double scroll key is placed under the screen, two soft-keys are near it from both sides. There is a modification of the M50 - MT50 which differs from the M50 by the from of soft-keys ( they are as in Siemens S35). A specific key is used to access the phonebook. A spacing of the function keys is standard, the only inconvenience you can feel while pressing 0 (the lower row, small size). However, the phones from other companies also often have such defect, but you get used to it quickly and almost don't notice it. Unfortunately, a keypad backlighting is not equal. The most bright keys are 2 and 8. The orange backlighting makes them almost invisible in the sunny weather. The letters and figures are clear visible in the dark and hardly visible in normal lighting conditions inside. A standard system connector is positioned in the bottom of the phone, it's similar to one in 35 and 45 series. An external antenna connector is placed on the rear cover. A front and the back covers can be changed to the other ones, the engineers made interchangeable ClipIT covers for Siemens M50. Phonebook. It's rather simple here. You can add only one phone number to one name and save only up to 50 contacts in the phone memory. 4 caller groups are supported: VIP, Family, Office and Free time. A user can re-name the groups and associate a specific ringing tone to each of them. A double pressing on the phonebook key calls a caller group list, an additional pressing calls a VIP list. You can also associate pictures (up to 50) to several names from your phonebook. Messages. This section is standard to all phones from Siemens. There are 9 pre-default templates and a space to 5 own templates. 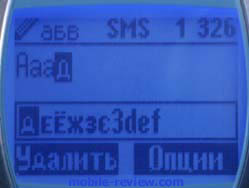 The handset supports concatenated messages (up to 760 characters) and EMS standard. It's impossible to send and receive MMS messages. Call lists. 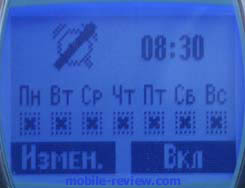 The lists of missed, received and dialed calls (up to 10 phone numbers in each) with date and time indication of calls. Here you can also find tariffing and settings of the broadcast messages. Contacts. You can set caller groups here, send SMS message to the whole group and program an alarm clock for different days of the week. Organizer settings are placed here too. You can create up to 10 text notes (50 characters each) and set a confidential status to each of them (to view this note you need enter a special code). You can also find usual reminders (up to 50) here. An alarm time and repeat time (daily, weekly, monthly, yearly) can be set for the them. Memorable dates are entered separately but they use the same memory space as reminders, so the total number of these notes is limited to 50. Internet/Games. The first item is WAP-browser (in version 1.2.1). A new game Kung-Fu is appeared, it is accessible through Battlemail. 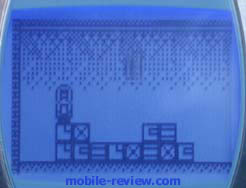 The second game is StackAttack2 - an interesting game where the user plays a loader role and sort out the falling boxes. 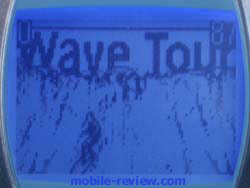 The third game is WaveGame - not very attractive in my opinion. Here you are the surfer who is surfing through very high waves. Also a Melody Manager is placed here. 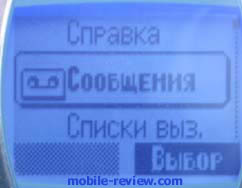 It allows to record any melody (up to 4) and download it with a help of special service (You can download melodies and pictures for Siemens 45 series and M50 from www.revkom.ru and www.inform.ru). You can also view and download pictures that further will be used as wallpaper or in EMS messages. Profiles. 8 profiles are installed here. You can adjust each of them as you like, almost all settings can be changed. Audio. All settings connected with the call alert and vibrating alert are collected here. You can choose one of the 20 pre-default ringing tones or one of 4 your own for incoming calls, messages and reminders. A peculiarity of the phone that is a ringing volume is adjusted separately for each caller group and it doesn't depend on the profile. Settings. Other phone settings are positioned here. Nothing unusual. You can set capital letters and then font size increases. In this case you can see only one item in the main menu, not few as with standard font size. Quick menu. It can be set by user and consists of the most frequently used menu items. Notably the M50 supports GPRS (class 8), which is better to use for WAP because the phone doesn't equipped by IR-port or cable for PC. You can connect M50 to PC via cables from ME45/S45. The settings are standard. The phone supports Java protocol which allows to install new applications (games, Instant Messanger (analogous ICQ on PC), the latter demands an operator support). In the whole a downloading of Java applications is realized only via operator services not via cable. Such decision is mostly a marketing policy, all operators earn money supporting this service. No claims to the audio quality: a clear sound, a volume is more than sufficient. The call alert is clearly heard on the streets, a vibrating alert is average but it can be felt through the case. Ringing tones are standard, a peculiarity of this model is a bit subdued sound in the beginning of sounding. The advantages are the lithium-ion battery, compact dimensions and a compatibility to the accessories of 35 and 45 series. The shortcomings are small phonebook (probably because Java and EMS technologies, which demand much memory space, are supported) and not equal keypad backlighting. As we have already said the direct competitor of the phone are Nokia 3410 and 3510. Siemens wins if to compare it with 3410, they have the same price but Siemens has more features. But it definitely loses to Nokia 3510 with a polyphony and better autonomy, though there is a small difference in price, the 3510 is 30$ more expensive than M50. Very often a design is a determinant factor while choosing a phone. As for me M50 has a better look than Nokia 3xxx series, but the tasted differ and may be you'll prefer Nokia.